Note: This post has been heavily modified to remove strong language. 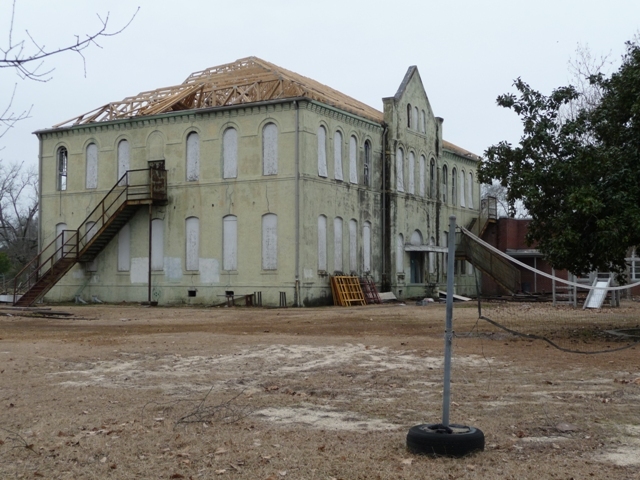 Driving past Hattiesburg yesterday under a brooding sky, I decided to swing by Eaton School, which I supposed must have a new roof by now, given that the Hattiesburg American article two weeks ago indicated it was supposed to go on that week. 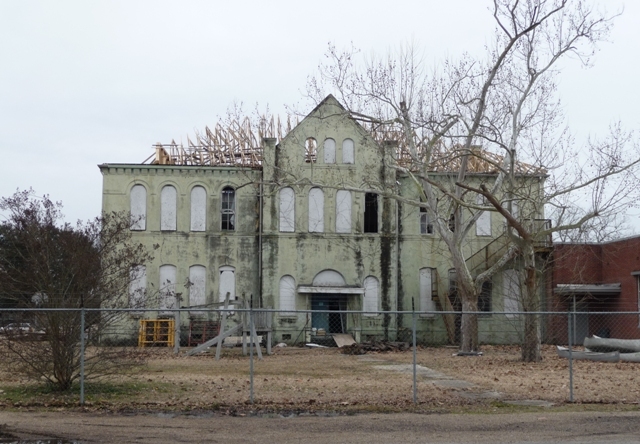 As you might recall, the entire roof structure of Eaton School (1905)–listed on the National Register and designated as a Mississippi Landmark–was being replaced due to major rotting in the original timbers, but due to either the architect’s or the contractor’s mistake, the first set of trusses was built at an incorrect slope, leaving the roof much lower than the original. So, they had to get another set made, meanwhile, inexplicably leaving the school completely open to the elements, with no attempt at ameliorating the situation. The graphic photo in the Hattiesburg American of the building two weeks ago still makes my blood run cold. But surely, I thought, I will find the new roof snugly on the building, protecting it from the latest rains and allowing the building to begin to dry out. Imagine my surprise when I came upon the building, yes, with the beginnings of a roof on it, but still in every way exposed to the elements! While this new roof appears to be the right slope (using the existing chimney as a gauge), the trusses look warped and aren’t braced yet. If these went up late last week, why in the world didn’t the contractor work through the weekend to get the building buttoned up? Is this incompetence, negligence, or both? Obviously the architect was in error with the original roof, but I’m also puzzled by the lack of urgency shown by the contractor. The interior of this building is beautiful beadboard–what kind of shape is that going to be in after this is all over? Whose bond company is going to pay for all the extra repairs that will be needed on the interior? As I drove north, I hit some nasty rain and I guess all we can do is hope that Hattiesburg didn’t get the same storm last night because that’s just another couple of inches of rain pouring into this poor building. The trusses look warped to me, but maybe that will be corrected when the braces go up? Notice the large puddle in the foreground. That and more is also inside the building after standing with no roof for almost a month. 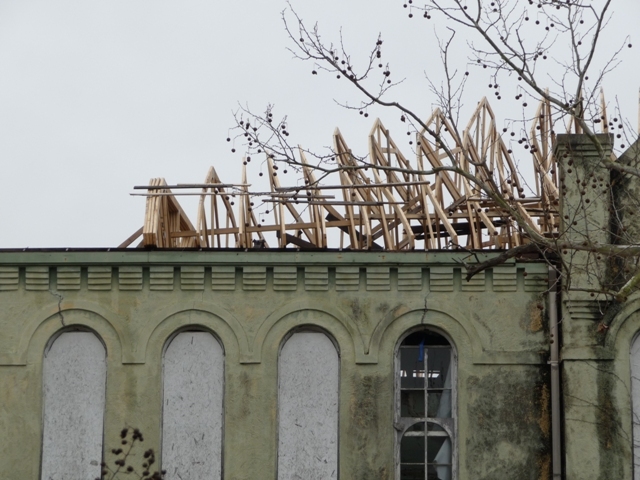 This is apparently what remains of the first attempt at roof trusses. Notice the low slope. This is a lot of money left laying on the ground. This does suggest incompetence run amok. Which agency or group is ultimately responsible? As you say, let’s just hope the rains don’t ruin everything inside. 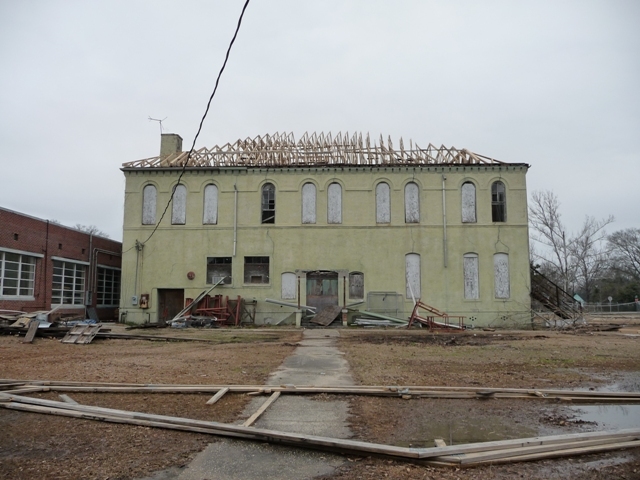 I’d hate to see this go the way of the Speed Street School in Vicksburg. I believe the city owns the building. The grant to replace the roof is through MDAH, but presumably the contractor is working for the city? 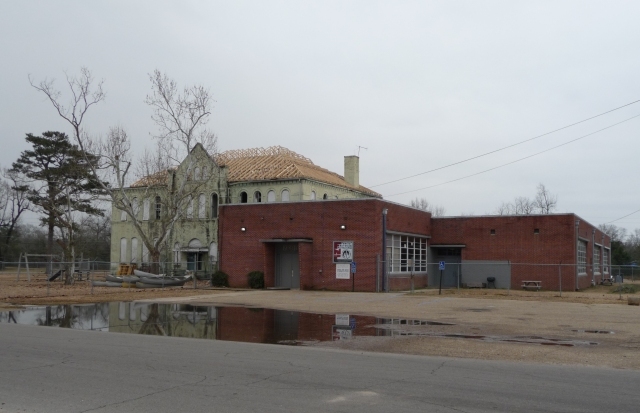 The article a couple of weeks ago indicated that a city councilwoman was trying to get the building covered, but apparently that fell on deaf ears. Maybe the problem is that no one is “ultimately responsible”? I agree, the wood looks horribly warped. 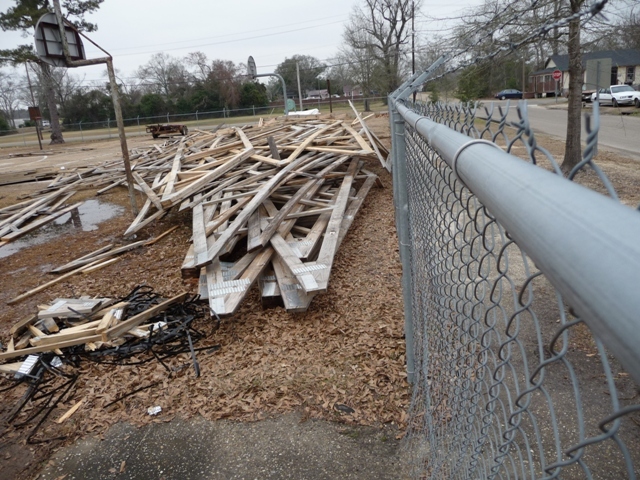 Another issue is that I don’t know whether it is because of the size of the school or some other factor but the wood looks far too thin to support anything, even just an asphalt shingle roof.